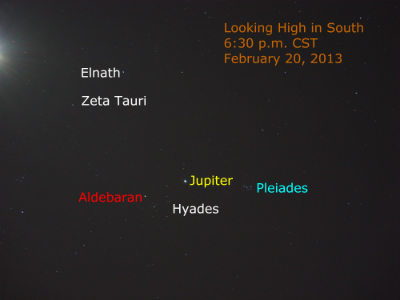 Bright Jupiter shines from high in the southern skies during the early evening of February 2013 as seen in this 30-second exposure image as seen from the Chicago area. ( Click the image to see it larger.) This giant planet shines from in front of the stars of Taurus and its bright star Aldebaran. Two bright star cluster, Pleiades and Hyades, are part of the constellation and shine nearby. The waxing gibbous Moon is just outside the frame at the upper left. For more about skywatching this month, see our February posting.